This recipe, as with many of my recipes, grew out of my attempt to make something at home that we enjoy eating out. 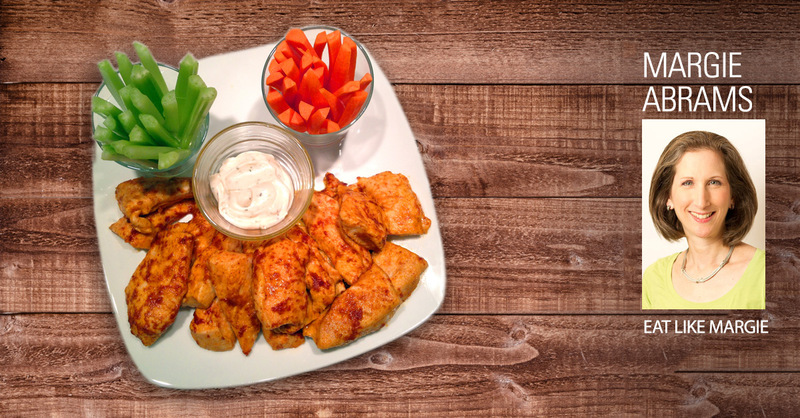 My family loves Buffalo-style chicken wings (as do I). What I don’t love is that they’re deep-fried. And so I made them at home myself—but baked. I was impressed, as was my family. Delicious! But I couldn’t enjoy them without feeling pangs of guilt because, after all, wings are mostly skin…and chicken skin is just plain bad for you. I tried again—this time using boneless chicken breasts. Also delicious…until I took a closer look at the ingredients in the two brands of Buffalo-style wing sauce that I’d purchased. While it was good that neither contained cane sugar (I am a nut to keep that ingredient out of my house), I didn’t like the oils—one had canola oil (not awful, but not great) another had soybean oil (also not a fan)…both contained “natural butter flavor” (that sounded scary! )…and 390 or 460 mg of sodium per tablespoon (that sounded high). “Okay,” I thought, “I’ll mix up my own wing sauce.” The popular recipes I saw online all included butter, which is not the villain that we used to think it is—but I’m off dairy, so it still doesn’t work for me. Besides the fact that the recipes called for a lot of butter. Now, I was determined to create my own. I looked at the ingredients labels of the wing sauces I’d bought, and then gradually crafted my own recipe, with help from my taste-tester husband. Yummy…healthy…and easy to prepare (that means I had all of the ingredients at home already and didn’t have to do any special shopping). A triple win!! I hope that you feel the same. Regarding the dipping sauce…I know it’s traditional to use blue cheese dressing. That, too, is dairy (besides the fact that I personally HATE cheese!). My tasty alternative is an herbed vegan mayo that I use for crudité or as a creamy salad dressing. It’s full of flavor, so you don’t need a lot of it. Preheat convection oven to 375 degrees (or 400 degrees in a conventional oven). Cover two baking pans with foil (for easy clean-up), and spray with olive oil spray. In a bowl, combine all marinade ingredients. Note: This makes about two cups of marinade. Coat each of the chicken strips in the flour mixture. Note: You can drop in several pieces at a time and fold the bag over…then shake. Put the coated strips back on the cutting board until you are ready for the next step. Dip each chicken strip in the marinade. Drain off excess and place on the baking trays. While the chicken bakes, mix up the dipping sauce. This is one of my “scoop and shake” recipes–spoon out some of the “mayo,” and then shake in the spices and lemon juice to taste. Serve with vegetable sticks. Celery is the traditional accompaniment to wings, and my photo shows that I also served it with carrots, but you can’t go wrong with any raw vegetable—e.g. cucumber, fennel, jicama, sweet peppers and cauliflower.